Today I would like to share the design process of an ecommerce theme that I recently designed. 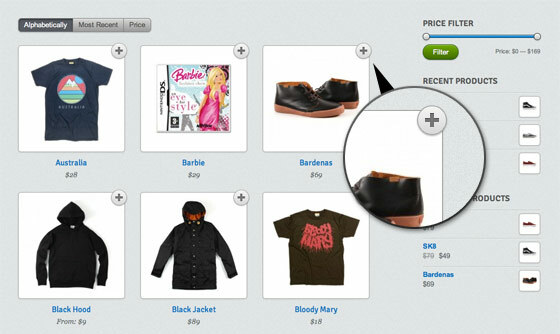 Shopdock is an Ajax ecommerce theme where the user can quickly add/remove items to the cart with a single click. It is actually inspired by one of my sites, IconDock. The design process was quite challenging to make an Ajax shopping cart with a responsive design. I will explain why certain design directions are taken to handle the design challanges for both desktop and mobile. As shown in the "Responsive Design in 3 Steps" tutorial, the technical side of creating a responsive site is very easy. It is just a matter of using media queries to reset the layout elements on specific viewport width. Planning the responsive layouts is rather more important. Each layout (break point) should be planned. In other words, you should plan out the layouts for desktop, tablet and mobile. 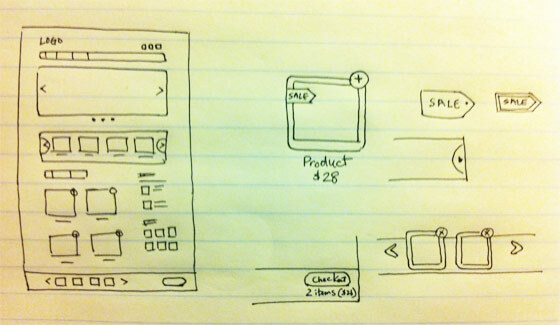 Below are the sketches I made for the Shopdock theme. Usually I only design a mockup for the desktop version. The tablet and mobile version is done with CSS while prototyping the templates. Because there are way too many devices and different resolution, it will take too much time to test the design with each device and resolution. I find the best way to test responsive sites is by resizing the browser window. Testing on the actual devices (iPad, iPhone, etc.) usually done at the final phrase when the prototype templates are completed. The user can add/remove items to the dock instantly by clicking on the add/remove icon. It makes the shopping experience much faster and easier compared to the traditional shopping cart where user had to click back to the shop. If the product has variants such as size and color options, obviously the single-click add item will not work because the user needs to choose the selection. So a lightbox window with the product options will pop for the user to pick. However, the lightbox solution doesn’t work well on mobile due to the small screen. Instead of popping the lightbox window, it will direct the user to the product page. The dock is invisible initially or when it is empty. When an item is added, it slides up beautifully. It is in a fixed position at the bottom of the page so the user has an overview of the cart. 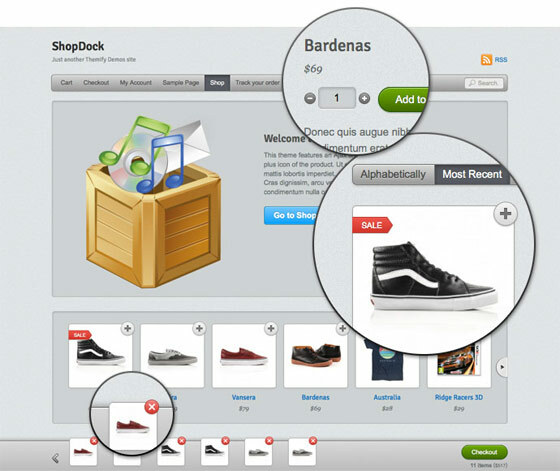 When an item is added, the product thumbnail is placed at the beginning of the dock so the user is aware when an item is added. The number of items in the dock is updated instantly. The loader animation appears whenever the dock is processing (whether adding or removing items). On mobile version, the product slider on the dock is hidden. But the cart total, loader animation, and the checkout button is still visible so the user knows what is in the cart. 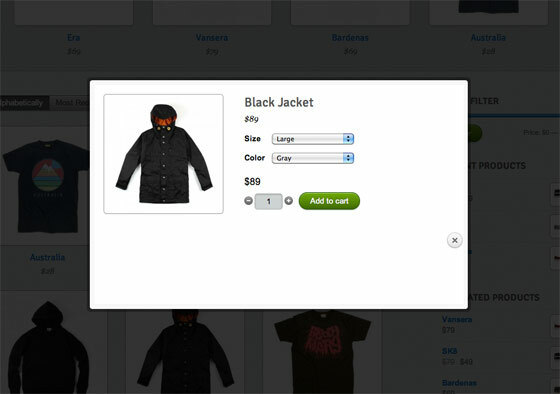 On the desktop version, the product slider is set to display 4 items at the same time. But on mobile, it resets the visible item to 2 to maintain a good size of the product container. 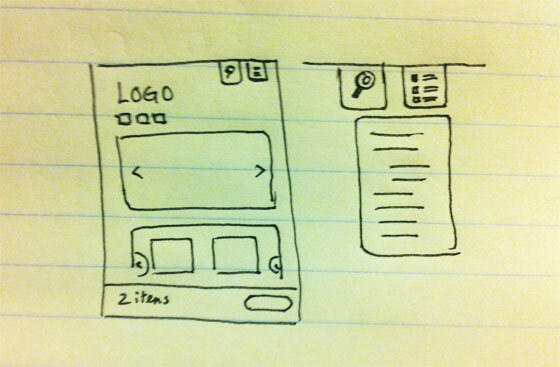 When creating responsive design for mobile, another challange is designing the navigation menu. If the site has 3 or 4 buttons, then it is fine. But if the site has more than 6 buttons, it often ends up with a unpleasant result where the buttons stack on top of each other (like the screenshot below). To solve that navigation layout issue, an icon/button is used to toggle the menu. The user can toggle the search form and the navigation by clicking on the icon. This approach is widely used on many mobile sites. Great jop! I love your design. Nice one. I like the simplicity of your design and the use of the white space as well. As stated above, very impressive and inspiring. In most of the shops when you add a product to the cart you are taken from the place you have been before, so it’s a bit of confusing. I absolutely love this design. Very user friendly. It is impressive post.I am felling glad on this article.can you more share with me.I have many ideas about it.I will come back as soon. Hi, You post a most important website designing article. I will be take your service recently. Wow. Great insight. Also, this degrades so gracefully sans JS! Very Nice Done! Love it!! Lovely slick design, only thing I would question is the ‘plus’ icons to add the items to the cart as i think intuitively this indicates an enlarged view rather than adding to the cart, maybe a cart or buy icon would work better? I love the theme. It works very well and is very clean. Very inspirate to me. I like the article like this. Wow, I still have a long way to go before I come close to your level as a web designer. But thanks for the inspiration! Great looking theme. The only problem is the cart location. We have done A/B testing where I work and very few people are going to see that little footer popup for their cart items. They are going to wonder how to get to their cart page to checkout. I would HIGHLY recommend placing a link in the header for the cart. Actually, making that bar slide down from the top of the page is a much better solution that will lead to higher conversions. Just passing along what I’ve learned designing ecommerce sites. Attractive blog. Using images are too much beautiful. Thought this was a great article and one that will very useful to me in the future. I really like your thought process behind the site and the way you have planned is something I am going to take on board for when I approach projects like this one. I also really like the design of the site you have produced, it has very clean a fresh feel through the use of colour and layout for both the desktop and mobile versions. WoW, a great and attractive work. Beautiful work. Apple has inspired the whole world. I also liked the attention to detail in every element of design. Ektaah, a crowd-funding platform, is launching a design contest to determine our logo and web design. The winner will receive an Apple iPad! Hi everyone. I heard about Ajax but i didn’t know how to use it in ecommerce theme. I really enjoyed this article and learns lot. Thanks for sharing this article. I like the quick shopping cart experience. I have been playing with opencart and I believe they have the same ajax driven feature with their cart as well. Way better process than the traditional shopping cart website. This does look like a great theme. 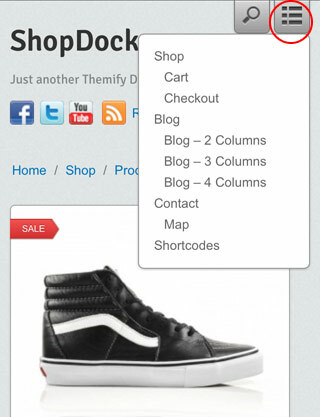 This is a great step in usability in webshop carts. The only thing you could think about is delete 1 item of 2 of the same. This is not possible at this moment in the webshop. Nice webdesign! Damn, I’m a backend programmer. I envy you for your frontend skills. Great work! May I ask what your experience is with systems like Magento or Opencart? This will be a great theme for the stores and it will help them sale easily and fast. Thanks, this is helpful. I’m about to embark on a redesign of a network of e-commerce sites, with responsive design being the main reason of doing so. You’ve given me some great ideas, thanks! Really great to see behind the scenes; most people don’t know all the work that goes into a successful site! Conversion optimization at its best in the real world. So many people get so involved in the science that they forget about the impact of aesthetic appeal overall. Nice work on the navigation toggle. I would have tried to do the same. Post your Links on Facebook, Twitter, Blogs & Websites! Go To http://http://netfly.co/V to get paid for your posted links! Go To http://netfly.co/V to get paid for your posted links! I just love the simplicity. Thanks for sharing. I have been playing with opencart and I believe they have the same ajax driven feature with their cart as well. Way better process than the traditional shopping cart website. can u tell me plz, how u add price filter slider in the 3rd image above….